I prefer to use cod fillet that I salt cure myself, it is not so dominating in flavour as the more traditional variety of salt cod available from the Mediterranean. I like to serve the cakes on a French bean and potato salad, drizzled with some piquant tasting salsa verde . 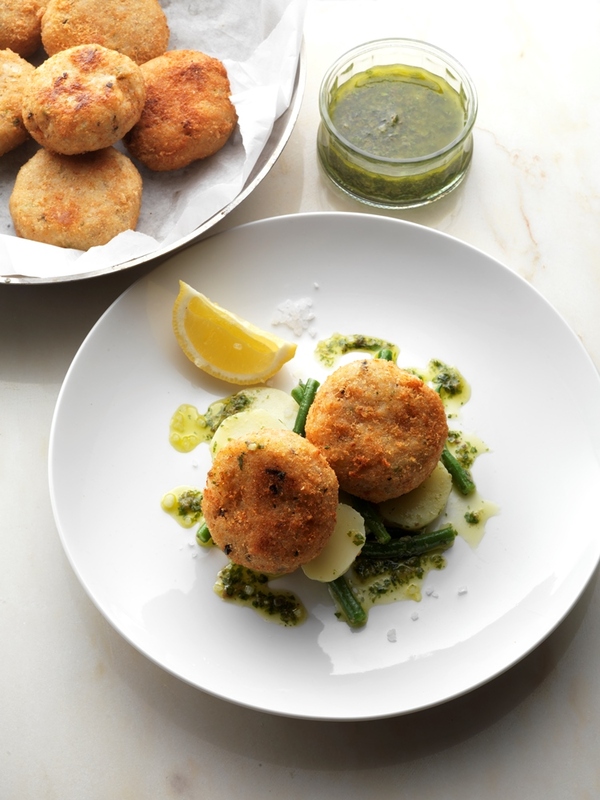 The cod cakes and the salsa verde can be made up to 2 days in advance prior to serving. Place the cod fillet in a non-corrosive dish, sprinkle over the salt, cover with cling film and place in the fridge for 24 hours to cure. Meanwhile make the salsa verde. Place all the ingredients in a blender and blitz to a coarse puree. When the rice is cooled, divide into 8 equal size balls , then roll in the palm of your hand and flatten them to form neat patties or cakes. Pass the patties through flour, the beaten egg and finally the breadcrumbs, chill until needed. Dress 2 cakes per serving on a bed of French beans and potatoes dressed in a little of the salsa verde then serve, garnished with the lemon wedges, and a little sprinkling of sea salt.